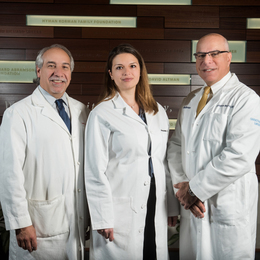 Now, as the associate chief of cardiac surgery at Einstein Medical Center Montgomery in East Norriton, Dr. Tuluca enjoys the same satisfaction her grandfather experienced all those years ago. There, she and her fellow board-certified cardiothoracic surgeons offer the full gamut of cardiac surgical services, from the routine to the complex—everything from coronary artery bypass to minimally invasive transcatheter aortic valve replacement, also known as TAVR. For many patients, the revolutionary cardiac treatment they receive at Einstein Medical Center Montgomery is life-changing, if not life-saving. With TAVR, for example, patients who cannot or prefer not to have open-heart surgery can have their aortic valves replaced safely, quickly and effectively. During the TAVR procedure, a surgeon inserts a biological heart valve into the patient’s aorta through the leg or the chest using a catheter and a balloon. The replacement valve, once activated, then functions like a normal, healthy valve. Because the procedure is performed using a small incision, and because it is usually performed under sedation rather than general anesthesia, patients tend to have a quicker recovery time and experience less postoperative pain and discomfort, according to Dr. Tuluca. Einstein Montgomery aims to offer surgical options designed to be less invasive, both in terms of the surgery itself and in terms of the disruption to the patient’s life. In fact, she says some patients notice a significant difference in their symptoms as soon as they wake up from surgery. “Heart surgery is a much different animal compared to other types of surgery,” says Louis Samuels, M.D., FACS, the director of heart surgery for Einstein Healthcare Network. As such, it requires a comprehensive perioperative team in order to do it well. Dr. Samuels says cardiac patients come to Einstein Montgomery “for everything but heart transplants,” adding that the collaboration with Jefferson’s Heart Transplant program enables Einstein Montgomery patients to be evaluated for this therapy, if necessary. This hospital has all the resources of Einstein Healthcare Network—and, thanks to the relationship between Einstein and Jefferson Health, all the resources of Jefferson’s Division of Cardiothoracic Surgery—at its disposal. What that means to the patient: fully customized surgical care, tailored to his or her individual needs. At its core, Einstein Medical Center Montgomery represents a prime example of the shift in American health care: Patients who used to have to travel into the city to receive the world’s best treatment can now receive the same exceptional care much closer to home. “The old-school thinking was that only the ivory towers could do high-end cardiac care,” adds Rohinton J. Morris, M.D., FACS, chief of cardiothoracic surgery for Jefferson Health. “But if you run a quality program, and if you pay attention to the results, we’ve found that we can export that expertise elsewhere. Einstein Montgomery is a perfect example of that. Ninety percent of patients should be able to be taken care of there, and we have all the resources nearby should they have more complex needs. Since opening its doors in 2012, Einstein Montgomery has become a pillar of the surrounding community. For Dr. Tuluca, being such an integral part of a team of cardiothoracic surgical specialists is the realization of a childhood dream. “Not long ago I was out buying shoes for my 10-month-old son, and when I went to the register, the man behind the counter recognized me,” she says. “After he saw the name on my credit card, he informed me that I had done surgery on his wife. I’ve been here at Einstein Montgomery for four years now, so I’m seeing more and more patients who tell me I operated on their neighbor or their brother-in-law or someone else they know.